Haridwar is one of the most important Hindu pilgrim places of India. 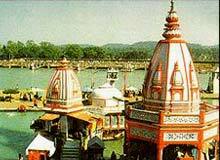 Haridwar has very rich religious and cultural heritage. In the Hindu scriptures, Haridwar is known by the name of Mayapur. Kumbh Mela (fair) is organized at the interval of every 12 years at Haridwar, in which about 1 crore pilgrims from all over the world participate. Besides its religious importance, Haridwar is also known for IIT (Roorkee), BHEL (Bharat Heavy Electrical India Ltd.), Gurukul Kangri Vishwa Vidyalaya and HQ of Uttaranchal State Public Service Commission. Haridwar is located at the foothills of the Himalayas and is the point where River Ganga reaches the plains. Haridwar is an important Hindu pilgrimage place since ancient times and is called the gateway to heaven. Even the Chinese pilgrim Hyuen Tsang, who visited India in the first millennium CE, mentions about Haridwar. He calls Haridwar as Mayura. The landscape of Haridwar is dominated by thousands of temples and ashrams and takes the visitors into a totally different world. According to legends, King Bhagiratha brought the Ganges on the earth at this place, where his ancestors were burnt to ashes by the curse of the sage Kapila. There are numerous bathing Ghats at Haridwar. The most sacred bathing spots at Haridwar are Gangadwara, Kankhal, Nila Parvata, Bilwa Teertha and Kusavarta. Hari-ki-Pairi (known for footprint of Vishnu) is the main Ghat at Haridwar. The most fascinating sight at Haridwar is the Ganga Aarti, held every evening at 7. The Ganga Aarti is a spectacular sight as it is performed in all temples at the same time. Hundreds and thousands of devotees crowd the Ghats at Hari-ki-Pairi to participate in the evening Aarti. The Aarti ceremony is followed by offerings of lamps and flowers to River Ganga, which makes a spectacular sight.